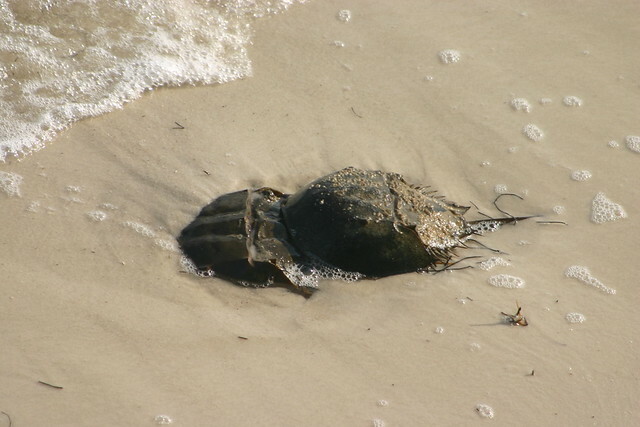 The horseshoe crabs are back into spawning season and FWCC is asking, once again, for sharp eyed naturalists to keep an eye out for mating pairs and satellite males. New and full moons, along with the high tide, tend to be the best days to view the animals as they emerge onto the beach to dig, lay, and fertilize their delicate eggs. The upcoming full moon on April 6th will likely be a day for high activity, particularly with the warm welcoming weather we’ve been experiencing in Florida lately. I’m hoping to catch some crabs in action this weekend near my usual stomping grounds on the Indian River Lagoon. As ever, I’ll be out on trash pickup duty, and hope to have some photos for curious readers to see exactly how the debris situation has improved (or worsened) since I was last out in the fall.